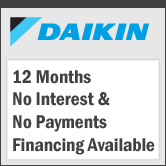 Through our financing plan, you can now take advantage of 100% unsecured financing on your next energy efficiency home improvement which allows you to make no payments and pay no interest if the loan is paid in full during the first 12 months! Through our financing plan, you can now take advantage of 100% unsecured financing on your next energy efficiency home improvement which allows you to make no payments and pay no interest if the loan is paid in full during the first 6 months! 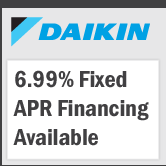 Through our financing plan, you can now take advantage of 100% unsecured 6.99% APR financing which allows you to make monthly payments on your next energy efficiency home improvement!